J. Ritchie Patterson is an elementary particle physicist whose research has given her a deep appreciation of the importance of accelerators as a tool for scientific discovery. As one of the few accelerator labs at a university, CLASSE has a unique opportunity to contribute to our understanding of particle and x-ray beams, advance accelerator and x-ray beamline technology, and to train future leaders in these fields. B.A., 1981, Physics, Cornell University. Ph.D., 1990, Physics, University of Chicago. Research Associate, Cornell Laboratory of Nuclear Studies, 1990-93. Assistant Professor, Physics, Cornell University, 1994-99; Associate Professor, Physics, Cornell University, 1999-2005; Professor, Physics, Cornell University, 2005-present. National Young Investigator, 1994-99; Alfred P. Sloan Fellow, 1994-96. Fellow, American Physical Society, elected 2003. Provost's Award for Distinguished Scholarship, 2005. Department Chair, Physics, 2009-2011. 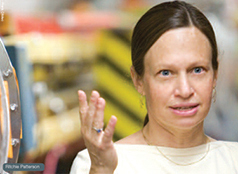 Director, Cornell Laboratory for Accelerator-based Sciences and Education (CLASSE), 2012-present. Patterson's research is centered at the Large Hadron Collider using the CMS detector. CLASSE research is conducted with major support from the National Science Foundation.